The Inca empire centred on Peru once ruled much of South America and had incorporated Bolivia into its empire by about 1200 AD, but was already in decline when Spain began its conquest in 1535. The Incas worshipped a sun god, and the warm yellow glow of gold was believed by many ancient civilisations to belong to the sun gold, or be related to the sun in some other way. Bolivia claimed independence in 1809 inspired by Napoleon's occupation of the Spanish capital Madrid. The republic was finally established in 1825. Bolivia and Peru were briefly united from 1836 to 1839, Simon Bolivar is recognised as a hero in both countries, and Bolivia is named after him. Bolivia has had a turbulent political history with over 60 revolutions, 70 presidents, and 11 constitutions since then. Discovery of silver at Potosi in 1545 lead to Bolivia also issuing large quantities of silver coins. 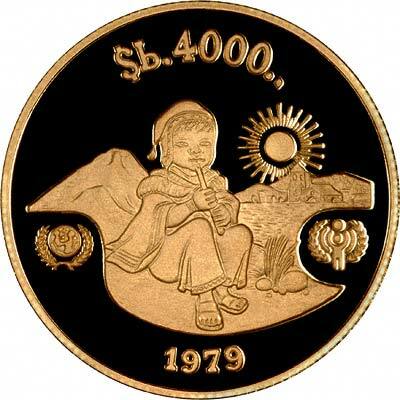 We occasionally have a small selection of Bolivian gold coins in stock. We show the specifications here of the most frequently held coins, followed by a list of coins most recently available. 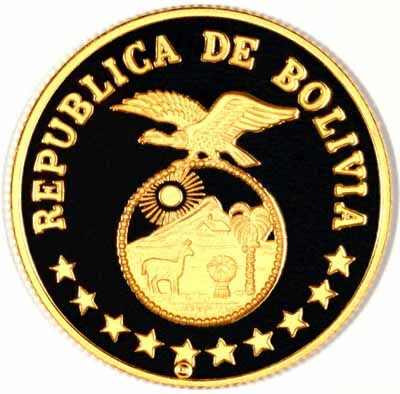 Technical specifications of the most frequently encountered Bolivian gold coins.